Athletics’ Slugger Davis Gets $33.5M Extension – Oakland Athletics slugger Khris Davis has signed a two-year extension that will keep him under contract through the 2021 season, the team announced Thursday. The A’s did not disclose financial terms, but sources told ESPN that the deal is for $33.5 million. Davis, 31, is batting .260 with a major-league-leading 10 home runs this season. He also has 20 RBIs. Davis led the majors with 48 home runs last season. He has belted 143 homers since joining Oakland before the 2016 season, the most in the majors over that span. 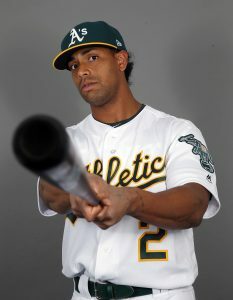 His three seasons with at least 40 home runs are tied with Mark McGwire and Hall of Famer Jimmie Foxx for the most in A’s history. Highlights: Nicholas Castellanos had three hits and drove in a pair of runs as the Detroit Tigers ended a five-game losing streak with a 9-7 win over the Chicago White Sox on Thursday. Grayson Greiner had a career-high three hits and two RBI for the Tigers. Miguel Cabrera, playing on his 36th birthday, also drove in a pair of runs as Detroit set season highs for runs and hits (14). With the score tied at 7, Greiner led off the eighth with a single and moved up when Carson Fulmer (0-1) hit both JaCoby Jones and Josh Harrison with pitches. Castellanos and Cabrera put the Tigers ahead with back-to-back sacrifice flies. Drew VerHagen (1-0) picked up the win after recording the last out of the eighth inning. Shane Greene pitched the ninth for his ninth save in nine attempts. Neither starter was involved in the decision. Detroit’s Tyson Ross pitched six-plus innings, allowing five runs, two earned,n seven hits. Ivan Nova gave up six runs on 11 hits in 6 1/3 innings. Legendary Chicago Broadcaster Chet Coppock Dies At Age 70 – Long-time Chicago sportscaster Chet Coppock has died from injuries he suffered in a car accident in South Carolina, his family confirmed Thursday. Coppock’s daughter Lyndsey confirmed the news on her Facebook page, saying the legendary broadcaster had been involved in a car accident last week, and died from his injuries on Wednesday night. “His passing is untimely, unexpected, and painfully sad, but all we can do at this time is remember how lucky we were to have such a unique and creative trailblazer help shape into the adults we know he was so incredibly proud of,” his daughter said in the post. Coppock was a staple on Chicago radio and television for decades, hosting the famous show “Coppock on Sports” on WMAQ Radio and pioneering sports talk radio in the city. He also hosted pre and post-game shows for Notre Dame football and basketball, authored five books, and was a strong supporter of numerous charitable endeavors, including the Easter Seals and March of Dimes. Coppock also worked for several area sports teams, including the Chicago Blackhawks. “His passion for the city of Chicago and its sports teams was unrivalled and always on full display through his larger-than-life personality,” Blackhawks President and CEO John McDonough said in a statement. “Those who had the pleasure to work with Chet were truly fortunate.” Memorial services are pending, according to the family.